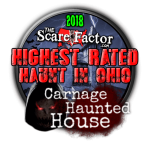 Carnage Haunted House is a Haunted Attraction located in Columbus, OH. 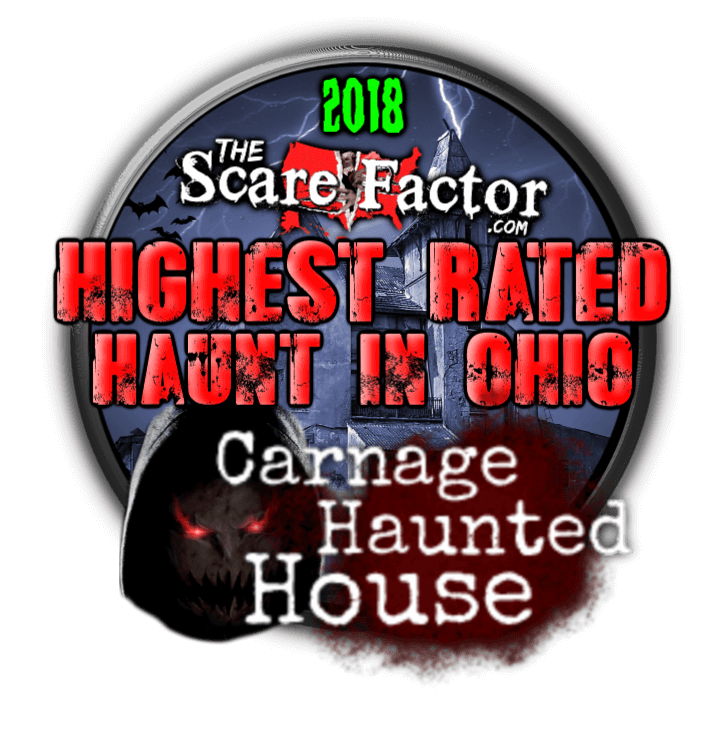 Carnage Haunted House opened up in Columbus, Ohio last season after only three months of build time and still managed to impress us with their offering. This year, though, they really showed us what they were holding up their sleeve and what they could do with a lot more time. 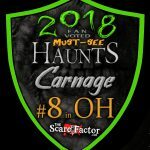 Their sets, actors and the entire haunt have really stepped up this year and become a force to be reckoned with. 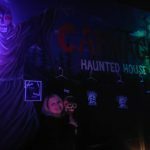 Theatrical-quality sets and immersive story lines within each scene draw you into an experience that will thrill even seasoned haunt goers. 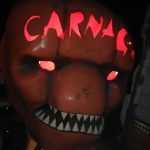 Carnage is letting the world know that they are here to keep their patrons entertained from the moment they arrive to the moment they leave. 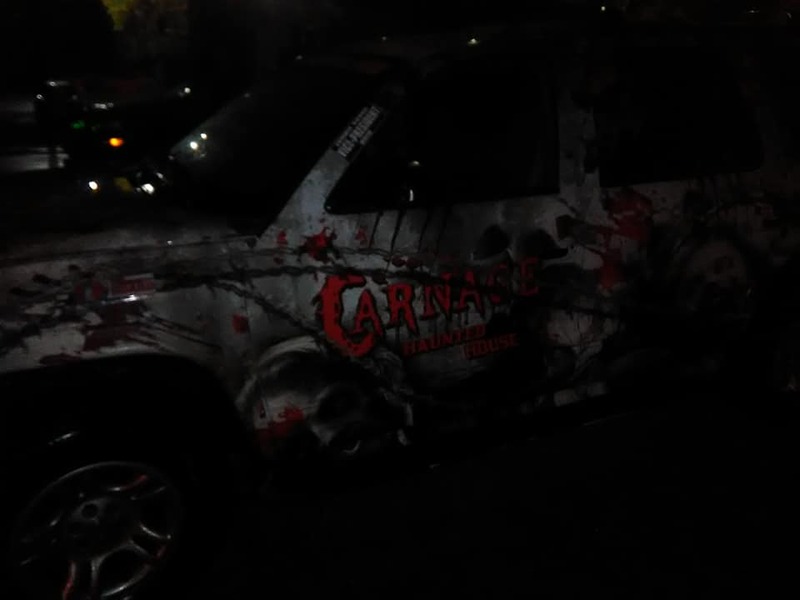 The cast at Carnage is absolutely insane. 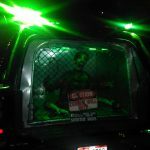 The staffing problem we have seen at most of the haunts we visited this year doesn’t seem to be affecting them at all. There were no noticeable gaps between actors, other than maybe in the dark maze. Their over-the-top performances and unique dialogue really knocked us off our feet, and we had a little trouble picking favorites. We would like to give a big shout-out to Mia Vitale Riedmiller and Aneaj Bokor for their performances as the rule reader and scene setter, respectively. Those roles require a lot of banter and improvisation that you really have to know your character for, and they nailed it. These ladies are so personable and enthralling in their roles, we kinda just wanted to hang out with them. 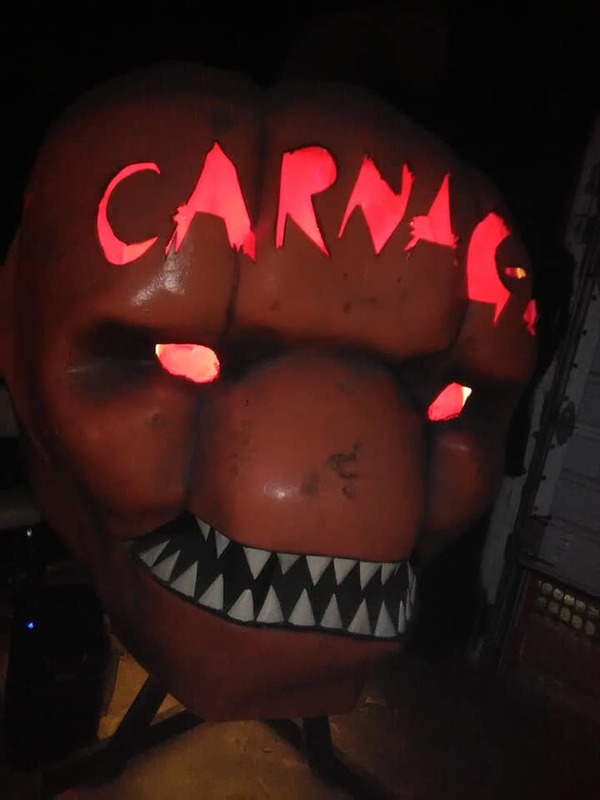 Carnage’s wardrobe department is filled with an extensive collection of handmade costumes and you won’t find any Halloween store products on their people. The distressing is realistic with no obvious scissor cuts or bright red paint on them. They don’t favor masks at Carnage, but the ones we saw were appropriate for their scenes, fit the actor well and allowed for clear dialogue. Their makeups are excellently-detailed airbrush creations by Morbid FX, which complete the characters without taking your attention away from their full ensemble. 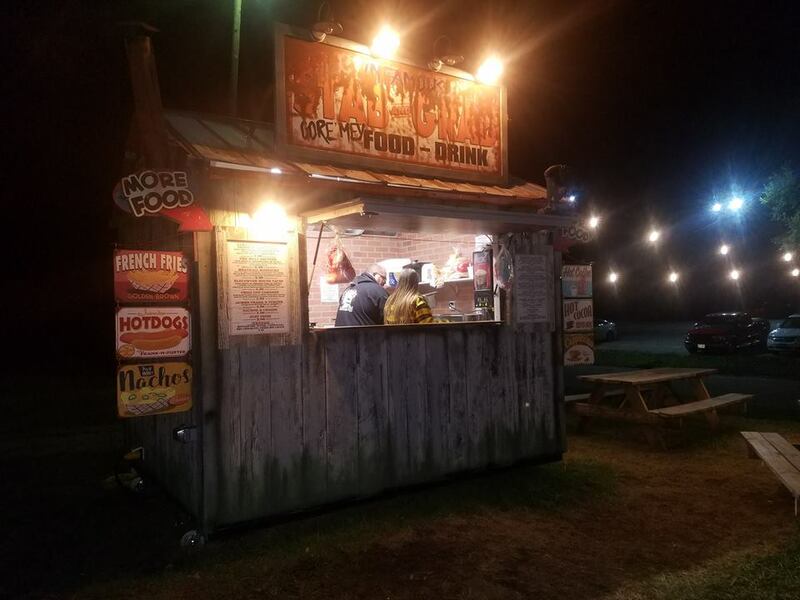 Carnage is located very close to the highway, so there isn’t a bunch of navigating through neighborhoods or dark country roads on your way. GPS will take you right there and there are parking attendants to greet you and guide your party into an available spot. 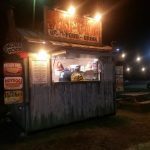 Parking is usually free; however, on very busy nights, you may be directed into the parking lot of the business next door. If that’s the case, there is a $5 parking fee imposed by the owner of that lot. The staff is friendly and passionate and more than happy to help. 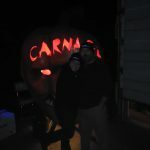 Carnage is one of the few haunts we visited this season that is wheelchair accessible, with bypasses for their claustrophobia hallway and vortex tunnel. The first thing you notice when arriving at Carnage is the movie being projected on the front of the building and loud music filling the air. 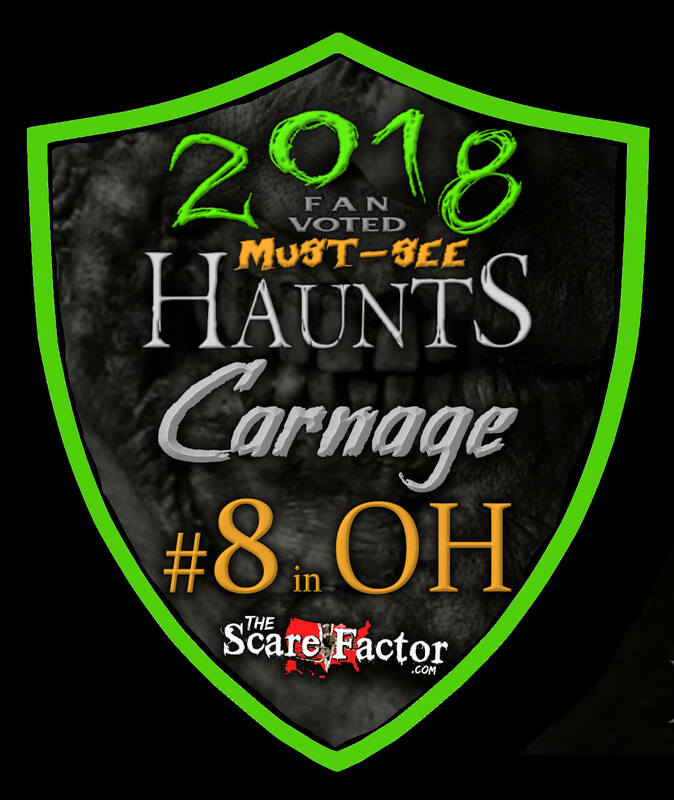 Costumed actors roam the grounds outside and the Ohio Zombie Guard provides some delectable eye candy with their extravagantly-decorated vehicles. There’s no mistaking that you’re at a haunted house and you’re in for one Hell of a show. Carnage does not skimp on the eye candy, and every scene has incredible details that they really want their patrons to absorb. Hidden in each room is an “Easter egg” from a famous movie, which you’re encouraged to find. Beyond that, though, the level of detail in each scene well exceeded our expectations and the unique scenes and scare effects are some of the most well executed we have seen this year. 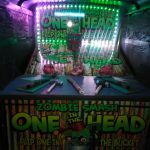 This haunt does not use a specific theme. 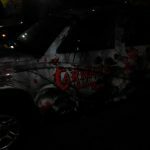 The actors at Carnage are very well trained, and aren’t content just to go after the weakest link in the group. As you make your way through the scenes, the actors hit multiple targets and make EVERYONE a target at some point. 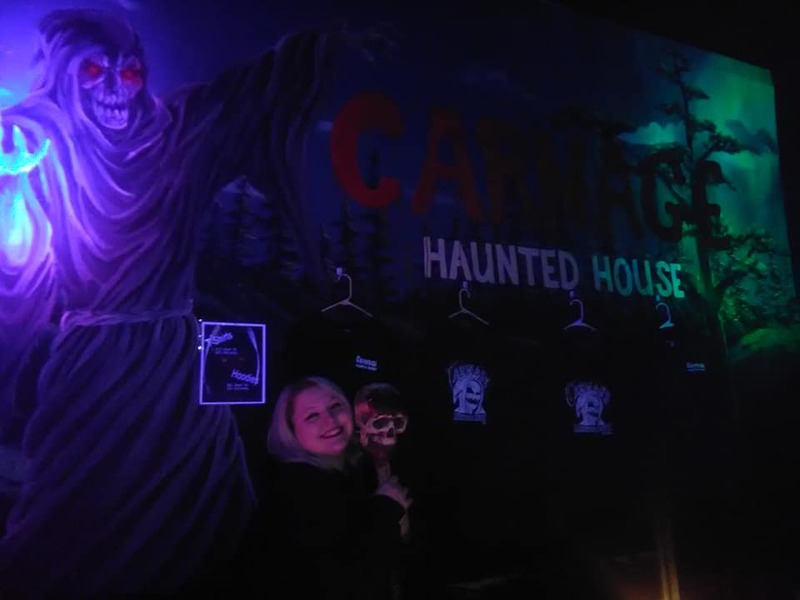 Your height and girth won’t protect you from the evils that lie within the walls of Carnage Haunted House. Be prepared to jump as scares come from out of nowhere and from the last places you would ever expect. 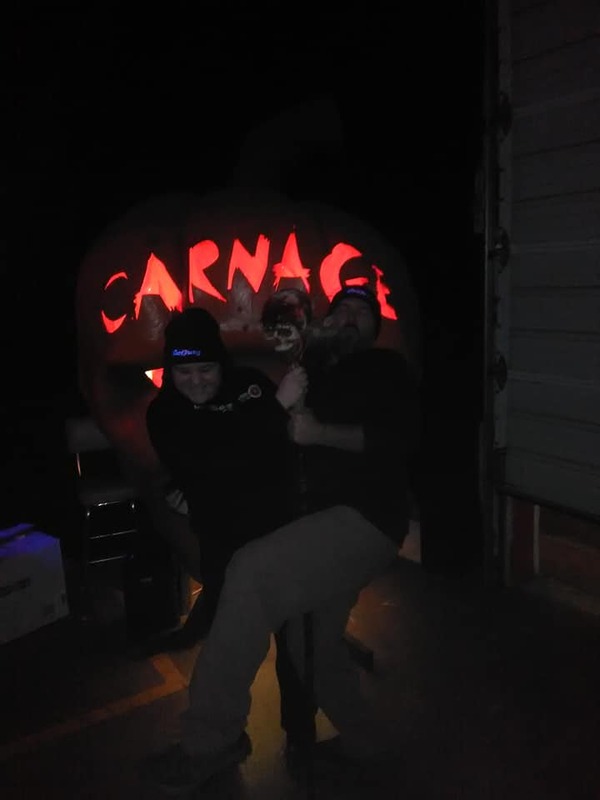 While a lot of them are the standard startle scares, the actors at Carnage did well at extending their skills into a variety of scaring methods. The ending at Carnage is a tricky one, and there are technically two endings. We won’t spoil them for you. Just be warned that when you think that you are finally safe… you probably aren’t. 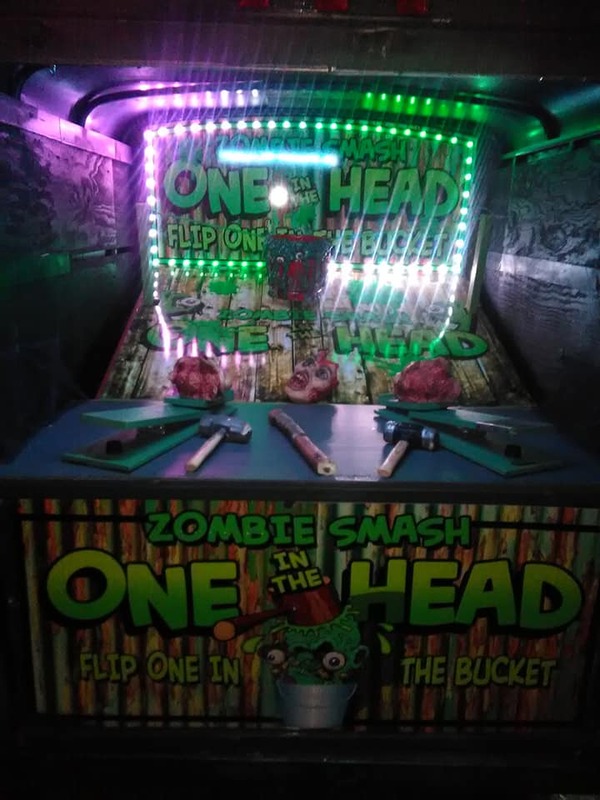 You definitely get what you pay for, and then some, at Carnage. 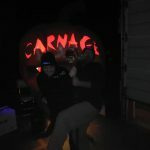 Their $20 General Admission ticket price is pretty standard fare for high-caliber haunted houses, but few provide as much entertainment as Carnage does. While you are waiting to enter, you are treated to a movie and music. 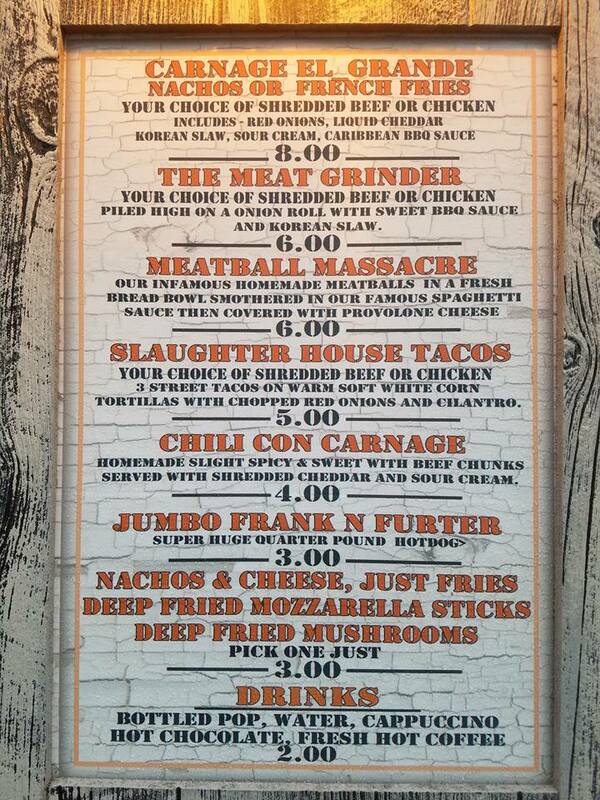 If you find yourself getting hungry, you can grab a bite to eat from the ‘Stab and Grab’ gore-mey eatery, such as The Meat Grinder or Meatball Massacre. 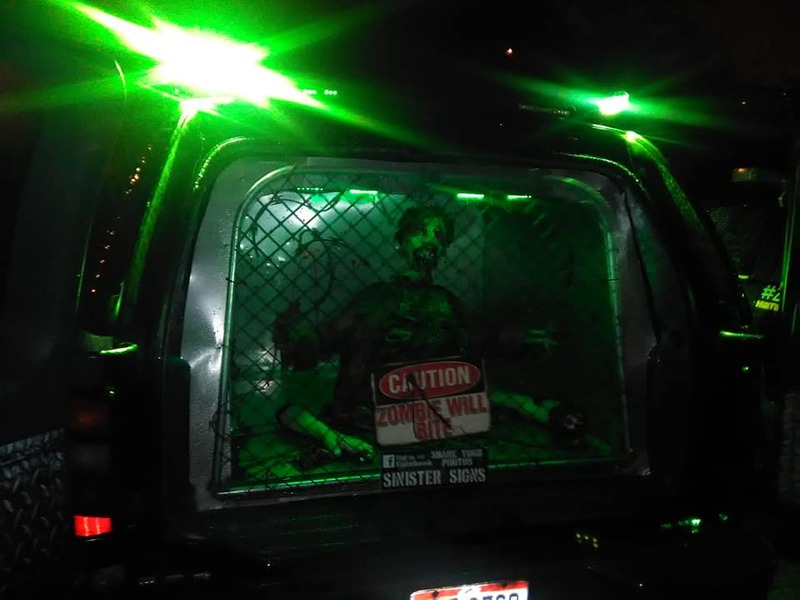 The incredibly-detailed vehicles from the Ohio Zombie Guard are on scene to provide some extra eye-candy and photo opportunities, as well as a zombie brain game to help pass the time. 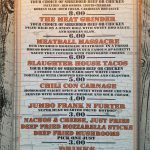 All of this and a 25-minute walk-through time gives Carnage a MPD rating (minutes of entertainment per dollar spent) of 1.25 and makes their ticket price a great, above average value. You can even get a fast pass for $7 more, which is still a pretty good bargain, all things considered. 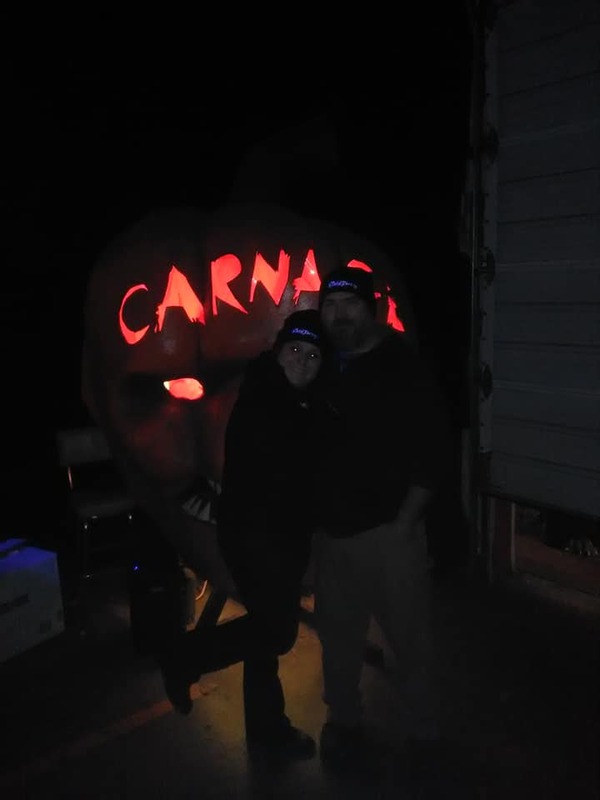 This was an awesome Haunted attraction. It felt fresh. That staff was courteous and the actors …show more inside…well that didn’t hold back. 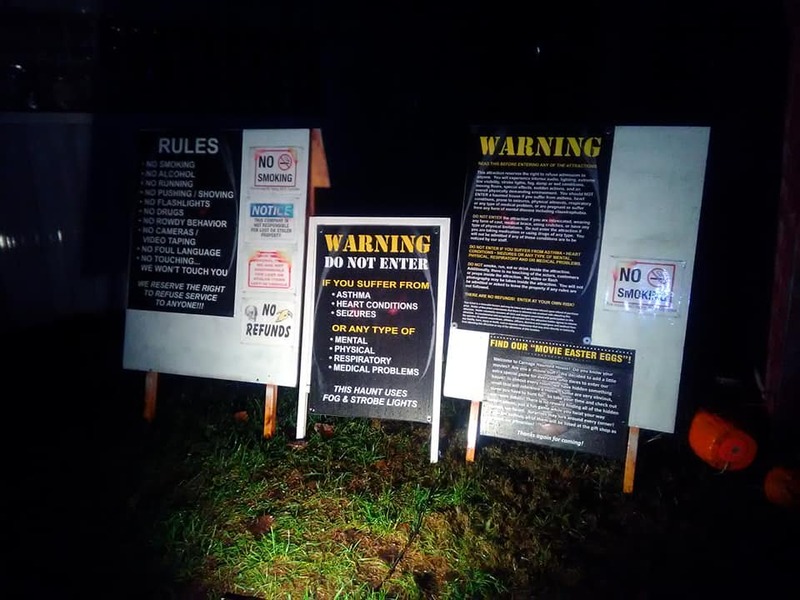 I would recommend this to anyone who wants a Halloween scare with friends and family.